Each of the 12 sons of Jacob, also known as Israel, fathered their own tribes, which collectively made up the Israelites. 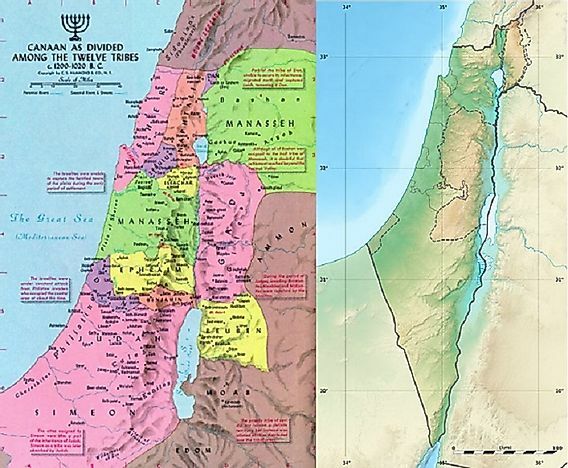 The 12 Tribes' respective territorial claims in Biblical times (left) relative to the geographic map of Israel today (right). The Biblical Twelve Tribes of Israel were descended from the twelve sons of Jacob, who came to be known by the name of Israel. These sons were Reuben, Simeon, Judah, Levi, Issachar, Zebulun, Benjamin, Dan, Asher, Gad, and Joseph. Joseph's sons Ephraim and Manasseh would be given land constituting their own respective tribes, while the priestly tribe of Levi would not have a de facto tribal area of their own. These twelve multiplied to form the Israelite people who have a religious and historical significance. The Israelites are a unique people in that they have a heavenly selection of God’s people. The Israelites moved to Egypt after a period of drought in Canaan. During this time, Joseph was residing in Egypt and worked in the Pharaoh's government as a governor over all Egypt. Due to his favor with the Pharaoh, his relatives were given a territory to settle. The Israelites multiplied into a great nation and the Pharaoh, who did not know of Joseph, subjected them to slavery as he feared they would overpower the Egyptians because of their growth rate. During their captivity in Egypt, God heard their cries and called Moses to rescue his fellow Israelites from their plight. Along their escape from Egypt they stopped at Mount Sinai, where God gave them the Ten Commandments which are still followed by Jews and Christians today. The Israelites crossed the Red Sea and were guided by God through the wilderness where they wandered for forty years due to disobedience and unbelief. During these forty years, God still provided for them with manna which rained from heaven. After the forty years, they were led into the Promised Land by Joshua. Moses died in the wilderness along with other adults except for Caleb and Joshua. The Israelites entered the Promised Land and conquered the previous inhabitants of Canaan. The land was allocated to the people according to their tribes. The tribe of Levi was given priestly duties as well as taking care of the Ark of the Covenant. During this time, the Israelites did not have a defined system of government, and their cases were heard by judges who were guided by God. The Israelites were not happy with this form of leadership and opted for a monarchical government. The first king was Saul from the tribe of Benjamin. King David took over leadership after the death of Saul and is referred to as the founder of Israel for his exemplary leadership and military skills. King Solomon inherited the kingdom from his father David and was notable for his wisdom and the building of the temple. He introduced forced labor in Israel exempting the tribes of Judah and Benjamin thus leading to the splitting of the kingdom into the Northern and Southern kingdoms after his death. After the division of the kingdom into Judah in the south and Israel in the north, the divided Israelites led separate lives, with intermittent bloody wars being waged between them. However, they maintained their religious heritage in observance of their traditions. The two kingdoms were disobedient to God through worship of idols, and they were conquered by other gentile nations. Judah was conquered by the Babylonians while Israel was conquered by the Assyrians. The tribes of Israel were scattered to various parts of the world as punishment for their disobedience. The story of the Israelites is significant both to the Jewish and Christian religious traditions, as well as to history as a whole. Most of the promises made in the Bible are given to them, and the adoption of the Gentiles into the Christian faith is said to be as a result of their dispersal. Currently, following the establishment of the nation of Israel after World War II, the Israelites are regathering into their ancestral homeland, and are in the process of rebuilding it, seen by many as a modern fulfillment of God’s promises to them.